Home / DadGeek / Nintendo / pc / playstation / reviews / switch / videogames / xbox / A lost soul, a strange planet, its a whole new world. Planet Alpha review. A lost soul, a strange planet, its a whole new world. Planet Alpha review. A lost soul, a strange planet, its a whole new world. Lost in space…Hurt, alone, confused and lost. You find yourself Marooned on a strange alien planet. Everything here seems equally beautiful, enchanting and deadly. Chased by an army of robots you run across the planets mesmerizing landscape in search of and answer to this mystery planet and its inhabitants. It is going to take wits and dexterity to make it through the wilderness.Only one primal instinct drives you forward. Stay alive. This is Planet Alpha, Team 17th 100th published game. Planet Alpha is the debut game from small team from Denmark. It combines platforming with challenging puzzles and stealth moments. Taking place on a beautiful and mysterious alien world, you are pursued by an army of enemy robots and must avoid local predatory wildlife and environmental dangers. Though you have no offensive capabilities to rely on you can use the environment to your advantage and you have one other skill that will help you do so. You can manipulate night and day on the planet. By shifting the solar cycle you can speed up or reverse changes in the landscape that can help you overcome the obstacles on your path, be it taking out hostiles with environmental dangers or opening up pathways to continue your path down the mystery planet. 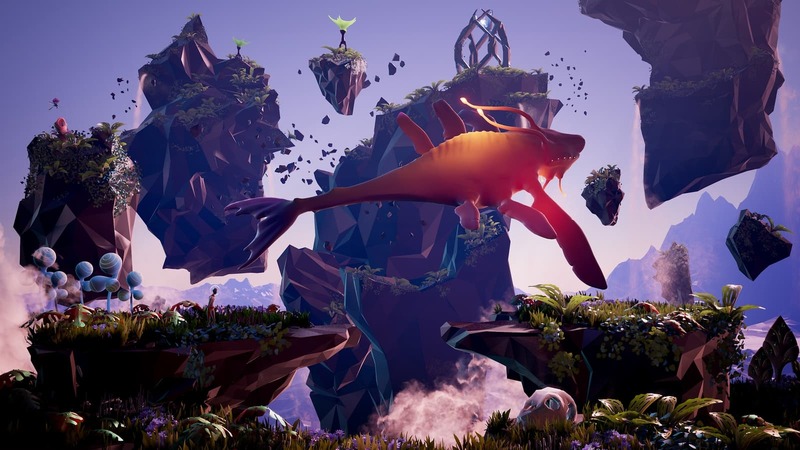 Planet Alpha is platformer, that involves a varied set of levels and challenges. You navigate a 2D plane left and right and climb up or down various obstacles and can leap over large gaps in the scenery. Even though the game is played from a 2D perspective it it build in a 3D engine.Unlike you, the player, Your enemies and the world around you can move across the 3D space and it will take trial and error to learn patterns and find solutions to the challenges and puzzles you run into along the way. There is no UI other then a few prompts showing you how to perform certain actions, giving the game a clean look. You have a jump button and an action button used to activate certain panels, crouch and drag objects. Then you also have two dedicated buttons (L1/L2) to forward or reverse the time of day. The entire world of Planet Alpha is affected by the solar cycle. As you advance and use this ability you are able to solve a variety of puzzles. Some give you insight in the story and the mysteries of this planet others allow you to move forward on your journey. For instance when facing a seemingly dead end, I focus my power to cycle forward and a larger mushroom grows overnight, large enough to climb on and use to leap across to the other side. In another area my path is blocked by some aggressive robot hardware. But a few feet back I saw a large beast lurk in the shadows. I get the robots to chase me , hid in the vegetation and cycle back to night, and it worked, the giant shadow lurking beast comes out and takes care of the evil robots. just when you get a feel for the controls a new level changes the environment to low gravity , forcing you to adjust once again. Thought the environments are beautiful, it is often hard to tell if an object is on your path /plane or further back and so I would often bump into an enemy or miss a platform because it was just part of the background and jump to my death instead. It is hard to know when you can and cannot hold on to a ledge or if you need to go up, down or back track first. At times it does feel this was a a clear design choice to add to the experience of being lost on an alien planet and fits right in line with the lack of UI on the screen to allow full immersion. But often games introduce a gameplay element at a time to allow the player to recognize a pattern in the following puzzles. Once the information has been conveyed to the player then a new concept gets added etc. Planet Alpha feel a bit lacking in this area. From the start it is entirely up to you to figure out what works in each area and try different things. Lucky there are a lot of auto save points along the way and load times are fast, so you never have to replay vast areas when you make a mistake. For some this might be a problem, for others that is all part of the experience. For me however Planet Alpha might not have grabbed me with its game play but it did with its presentation. 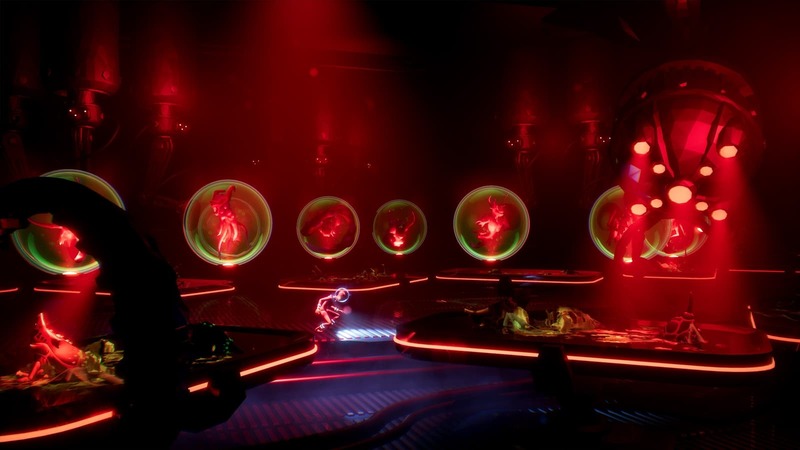 This is a beautiful game with strange alien locations, glow in the dark vegetation, a large variety of strange life forms, beautiful horizons and topped with 60's style robot terrors that feel straight from old sci-fi such forbidden planet and lost in space. Planet Alpha feels like a cross between "Shadow of the Beast" and "Another World" , games that also had amazing world full of wonder without a lot of exposition. 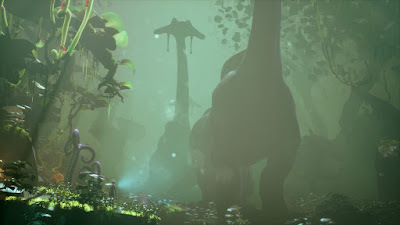 You do not get told what happened, you experience it.The game is spread over multiple varied parts of the planet from grazing fields with large almost brontosaurus like beasts trotting around , to underground caves with amazing monsters as large as a building tunneling throughout the level. The regular interaction you can have with the environment and use it to move forward or to eliminate and enemy make it feel that more alive. With added day and night cycles to manipulate the environment the game feels mesmerizing and it is tempting to stop and take a moment to take in all the action in the background. It is at times distracting when the camera pulls back a bit back and you have added elements on the foreground blocking your view, it makes it hard to see where you are going, but it does feel very cinematic. When the game reaches a point of a chase scene the camera pulls out, shifts at a different angle and brings you the action in a very cinematic point of view. With all these creative designs the look of the main nameless protagonist just looks plain and dull. No distinguishable features, wearing a basic spacesuit and helmet. Then again he is some alien dude from and alien world, with no recollection of why he was even there. So I won't judge his boring outfit any further. Besides the artwork, Planet Alpha also features a beautiful soundscape of animals sounds, aliens, robots, nature and background synths that regularly swell up into a beautiful cinematic orchestra piece. Sound queues are present to let you know of upcoming danger or an piece of environment that can be manipulated. The game has the option to enhance the sound base on your setup, be it headphones, TV speakers or Surround sound. So be sure to make use of the setting. The mystery of this planet unfolds slow, there is not much to go on at all. Across each level there are certain moments you can activate a map of the planet you are on where you see points of interest, and as you move forward, if you pay attention you can see the action in the background tell a story of invasion, strife, and more. But there is no exposition ever of what exactly is going on. The whole game paints a picture while you play about what is happening around you. Seeing the invading robot army take down a majestic sky whale tugs the heart strings, while another flying beast pierces through a command ship makes you clench your fist and cheer victoriously.The sounds of strange critters in the dark make you nervous as you crawl ahead and you watch in amazement when flying jelly fish like creatures light your path. It is amazing that a game with so little information can evoke feelings so well. And it was this emotional pull that kept me playing the game, despite whatever frustrations I had with the gameplay at times. The ending was a bit anti climactic for me, but without giving away too much, it the game encourages to attempt more playthroughs when you finish. I would not be surprised I had not seen the true ending yet and possibly missed many secrets explaining more of the mystery. At the time of writing there was no ESRB rating, but as the game has a European rating of PEGI 12 , i expect that the rating will be no higher then a E10+. I do feel the game is appropriate to be watched or even played by all ages. But for the younger and inexperienced players the game will be very challenging. Though it is not undo-able and can promote ingenuity, perseverance and experimentation. As there is no spoken or written language during the game, so you do not have to be able to read. The game has tense and sad moments, but there is no gore and the beautiful environments can be very peaceful to watch as a player or a viewer. At times Planet Alpha is a game of contradictions, Beautiful environments, but a plain looking protagonist, Great at communication emotions but bad at communication gameplay, Interesting puzzles, sluggish controls. It is clear that this game was build with love and a lot of effort. And if you can deal with the controls and accept them as part of the story of discovery then you can have a beautiful experience playing this. If you need tight controls and more handholding then you might want to give it some thought or if possible get someone to play it while you watch. Planet Alpha is a fantasy of roaming an alien planet and experience its wondrous environments to life, while your are chased by killer robots. PLANET ALPHA is available to download from today for Xbox One, PlayStation 4, Nintendo Switch™ and PC via Steam for £15.99 / $19.99 / 19,99€. Limited time launch discounts will be available, please check your local digital stores for availability and conditions. *A day one patch has been released to address some issues such as navigation and gameplay glitches at launch.